We have often been asked why the magazine was called Tradetalk. In a way the reason is very simple. In Germany the RuneQuest-Gesellschaft e. V. or The Chaos Society, had been producing there magazine Schattenklinge for nearly 10 years. But this was not popular with most of the RuneQuest/Glorantha fans, because the main language in which RuneQuest/Glorantha material is written is English/American (and who can speak German except the Germans? - only a few people). So Jörg Baumgartner declared English to be Tradetalk, as English is understood in most countries, the decision was made to take the name 'Tradetalk' for the magazine. Contributions: Contributions by fans of HeroQuest, RuneQuest, and Glorantha, and especially artwork, are welcomed. Tradetalk is a magazine created by fans of roleplaying for fans of roleplaying. 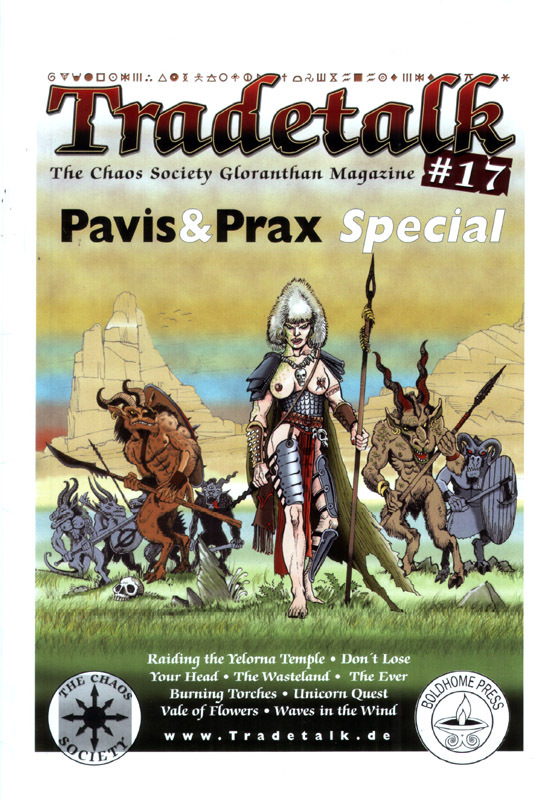 This magazine only exists through your support, so if you have written an article, an exciting adventure, an interesting description or made maps or artwork for Glorantha please send it to Tradetalk@t-online.de. You can see a list of contents for all of the issues of Tradetalk under our issues link. This area also contains the full details for our current issue with the current issue link. Also we have many wonderful people working for Tradetalk, find out a bit about them with our staff link.